This book is just too darn long! Argh. Okay. Since I just found out the book is 700 pages, it explains way the audiobook was 38 hours long. If it wasn't for the audiobook, it would've taken me months to finish the paper pack. I don't think I could get through 700 pages of everyday life of Claire and Jamie Fraser in Paris, in just a month. At the beginning of the book I was confused. Claire's back in her own time? How? My first image of Brianna was the American version of Merida from Brave. She's tall, large, has waist length red hair, and bright blue eyes. She is also obviously Jamie's daughter. But how is that possible? So many questions, so many words, so many pages, it just makes you want to skip through the whole book and read the last few chapters. As much as I would love to know every single detail of Claire and Jamie's life and plans in Paris, there aren't that many exciting things going on, that it feels like such a drag. About 20 chapters in, I desperately wanted to at least go back to the 1960's, and see how real-time Claire is doing, instead of continuously dragging the time in Paris. I love Jamie and was very happy to read that he is there for 95% of the book, I just really hate how long this book is. There were exciting bits towards the ending, and that was when things started to get serious. It was in the last 10 chapters that kept me awake. Excitement, worry, and angst came up from the shadows of the dull emotions that were felt throughout the book. Will they live? will they die? How does Claire go back? 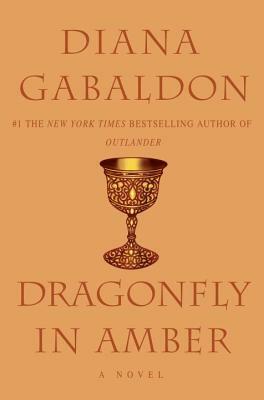 Dragonfly in Amber can be a bit dull when it comes to the details, but these details will I'm sure be relevant to the next books in the series. This book is sort of a base or a history book to turn back to when one feels lost when reading the next books of the series. I am very happy to be done with this and pretty interested to know what will happen next. I'll give it a month or a few weeks before I pick up book three of the outlander series.